The MXR Dyna Comp, the wildly popular compression pedal, has found its way into the rigs of guitarists as wide ranging as Joe Perry to Tim Mahoney to Johnny Garcia, as well as into the pedalboards of countless other discerning guitarists, looking to add a touch of sustain to solos. For sale is an MXR Dyna Comp compressor effects pedal that was professionally modified by JHS with the Dyna Ross mod. Th e tone of this thing is amazing, and it works perfectly. Only the pedal itself is included. MXR Dyna Comp Mini Compressor M291. 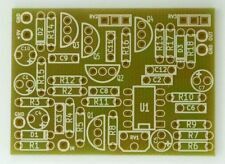 CA3080 Circuit. The MXR Dyna Comp Mini Compressor is housed in a chassis nearly half the size of the original while still retaining the best of the classic tone of the original. Used MXR M291 Dyna Comp Mini Compressor Guitar Effects Pedal! Classic MXR compression in a space-saving mini housing. The Dyna Comp Mini Compressor combines the best of classic tone and modern convenience in a housing that’s nearly half the size of the original. CTS pots indicate a 1981 production date. Boss dod digitech Ibanez maxon keeley analogman foxrox zvex strymon marshall fender hermida lovetone lovepedal klon eventide way huge. I'm including an adapter so you can connect the pedal to a standard Boss barrel style AC adapter. This is the older block logo without the LED. All the components on this pedal work exactly as it should without any issues - no scratchy pots and very responsive footswitch. Furthermore, everything is original on this pedal. Dunlop MXR Dyna Comp M102 Compressor Guitar Effect Pedal. Free U.S. Shipping! You are looking at a MXR Dunlop Dyna Comp M102 Compressor. And you know what?. ® DYNA COMP. ® BASS COMPRESSOR. We're knowledgable, helpful, and prompt. MXR DYNA COMP SUPER CLEAN DUNLOP MXR DYNA COMP WORKS PERFECTLY SOUNDS GREAT! This is the Dunlop reissue that works perfectly, sounds great, and is nice and clean. These are on just about everybody's pedal board and should be on yours too. MXR DYNA COMP. I HAVE MORE COOL PEDALS. It uses a signal-limiting processor that varies its gain so that the output signal stays constant. The MXR M-102 Dyna Comp Pedal features Output and Sensitivity knobs and LED on/off indicator. Dyna Comp Compressor Pedal. Pedal is in good shape for the age. Box is in very old condition. It uses a signal-limiting processor that varies its gain so that the output signal stays constant. The MXR M-102 Dyna Comp Pedal features Output and Sensitivity knobs and LED on/off indicator. ( 2 FREE MXR ). Compressor pedals are required gear for modern guitarists. The sustain and clarity they bring to your tone makes them must-haves. It is simply the most convenient MXR Dyna Comp yet. If there is one option Dyna Comp fans have wished for over the years, its to add a bit more of a natural attack to the pedal's character. MXR Dyna Comp Compressor - Modified. MXR Dyna Comp Compressor. No matter if you think the compressor has too much bass or too much treble, you can adjust it. Ross Mod - The Ross compressor is considered the holy grail of compressors in a pedal. For these reasons, the Dyna Comp Compressor has been the secret weapon on countless pedalboards for years. • In-line compressor “evens out” your signal. Current Draw 3.3 mA. Max Compression 36 dB. T.H.D 0.2% Typ. Modified MXR Dyna Comp- Includes Ross Mod Plus a Little Surprise! 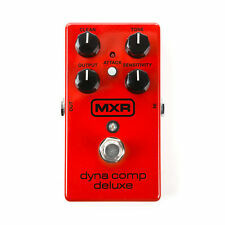 You have probably already seen or heard about the MXR Dyna Comp. It’s a good pedal and is used by many professional musicians. We added the"Griffin Effects Dyna Comp Tone Contro l" to this modified Dyna Comp. The original Dyna Comp Compressor has always been more than a utilitarian effect—guitar players have used its percussive tonality to enliven their tones for years. The Dyna Comp Deluxe Compressor gives you all you need to make this classic effect support the sound of your rig, from squishy ’70s compression to the open, transparent “light touch” compression favored by many modern players.